I've always been a big advocate and a firm believer in Style not being about how much something costs but about how you wear it. I still believe that despite the fact that I do like to spend a little bit more on my wardrobe now. I'm aware that not everyone has the same budget or disposable income for buying clothes, but I think it's safe to say, that we do all want to look and feel great in what we wear. My style has evolved over the years, it wasn't always so 'classic' and 'chic' as it is now and I used to be much bolder with colour and prints (see evidence in my Style Evolution video). But as I got older, certainly once I hit 30, I found that my taste became more refined, my colour palette more neutral and some might say, everything became a bit 'safe'. I'm ok with being safe, I've reached a point in my life where I know exactly what my style is and what works for me. If I want to experiment with something then I will and I still dip a toe in to the occasional trend here and there, but for the most part my style is really pretty basic. I'd be lying if I said I operate off a Capsule Wardrobe because clearly I don't, my 35 strong coat collection (and growing) is testament to that. I've always said that I see myself as somewhat of a product tester and I like to buy things or try things from brands so that I can give feedback to you guys. However if I were to categorise for example, my coat collection, then you would see that actually the theory of a Capsule Wardrobe (classics) is there. My style is about classics and versatility and the good news is that regardless of your budget, this is actually very easy to achieve. One last point I'd like to address is quality and sustainability. I had a woman comment on a recent Instagram post of mine where I was wearing some amazing Charles & Keith boots in an outfit in which I was also sporting Judith (my Loewe Puzzle bag). Her comment referenced how she couldn't believe that I'd paired 'plastic' boots with such a beautiful bag and how the quality between the two items was so drastic. Well ok, it's a given that a bag that costs over £1500 would be of a certain quality; pretty damn high for that kind of money. The boots priced at £75, in my opinion, are incredible quality. There is no valid reason, other than personal preference why PU items (from certain brands of course) should be thought of as 'bad quality'. I have a few items from Charles & Keith now, both bags and footwear and I can certainly vouch for their quality, as can their massive global following of obsessed customers. My point is that just because something is of a lower value, or not made from a specific fabric, doesn't mean that it's naff. Over the years I've had coats from high street stores that have cost me less than £60 and they lasted years, and they still had plenty of life in them when I decided to donate them to charity. When it comes to sustainability I think people are being mislead into the idea of having to buy from sustainable brands, which are usually in a pretty high price bracket. That's all well and good if you can afford them but what if you can't? Well, sustainability is also about buying less, shopping smarter, wearing your existing items more and looking after your garments with care. So if you want to buy that £70 coat from Zara, because you can't afford the one that's double the price from a Sustainable brand don't be made to feel guilty about it, just make sure it's a wise purchase (both classic and versatile) and that you'll wear it for years. It's also about recycling; donating those clothes you no longer want or need to good causes or selling them on if you want to invest back in your wardrobe and buying pre-owned/vintage instead of buying brand new. I know not everyone will be on board with buying vintage or second hand clothes and I get it but it's not all about shopping in smelly shops, sites like eBay, and selling apps like Depop have loads of sellers who list items which are brand new and unworn, often with tags still attached. It's always worth following your favourite bloggers on these platforms because there will be some great finds as we de-clutter our wardrobes from time to time. You guys know by now that I love a designer handbag, and as my income has grown over the last decade they have just become something which I like to treat myself to. However the vast majority of my bags are pretty classic and don't involve in-your-face logos (minus the Chanel's), so they're easy to copy and get the same look but for much less. I tend to stick to very basic colours when buying bags because I want to get as much wear out of them as possible so I need them to be versatile. Black is a failsafe colour option for any handbag whether it be designer or high street. Don't be made to feel that black is boring because that's far from the truth. Black is classic, versatile, practical and most of all chic. If you already have a classic black go-with-everything bag then navy or burgundy are perfect colours for Autumn/Winter and provide an alternative dark shade to black. But for a lighter option I also love earthy tones, browns, beiges, camels etc. The high street is doing an incredible job of putting their own spin on designer bags these days so if there's a certain bag you've seen on the runway or on a blogger then the chances are you'll be able to get a dupe on the high street. I do have a few favourite stores which have great looking bags at affordable prices, heck I even bought some of these bags myself they look that good, so I've gone through and picked out all my favourites that I would actually wear and that fit in with my style. A lot of high street stores even have real leather options which although more expensive than PU/synthetic materials, are still a fraction of the price of a designer bag. So if you really just can't 'do' PU then they're worth a look. I've already admitted my slight addiction to buying coats but honestly, no one person needs as many as I have. A couple of chic coats and one practical one should do you for the chilly seasons. Having one dark option and one lighter option would be the ideal situation because that way you have two strong classics for creating outfits. Then perhaps a puffer (yes don't brand puffers as not being chic), Parker or faux fur/teddy coat as your more casual cold weather option. I see my coats as the most important part of my Autumn/Winter wardrobe because no matter what you wear, they will go on top and will always be seen, so they have to look great. It goes without saying that your coat choices do depend on your lifestyle and they have to be practical because they're going to be worn every single day. If you have children then a lighter option might not be the most practical option as they are more prone to showing up stains. In which case perhaps you opt for a basic black and the a brown or grey check. However if you feel you can keep stains at bay then I would say you NEED a camel coat in your life. The camel coat is a game changer, not only is it versatile but it is the epitome of chic outerwear. There are lots of different shades of camel so it's just down to you to find a shade that suits your colouring, and to find a style that you absolutely love. But to give you a helping hand I've popped my faves, along with some other chic colour options down below. A tip for buying coats is to buy at the end of the season in the sales because you can get a much nicer coat for half the money. Zara often do great coats in their sale as do Mango and despite what you might think, you can find classics in the sale. Also buying coats on the high street doesn't mean that you won't find natural fabrics, stores like H&M have cashmere mix and 100% wool coats for under £100. Besides my marital bling I don't wear fine jewellery. Most of what I wear is gold vermeil or gold plated. I don't have very acidic skin so gold plated pieces tend to last a long time for me and I like lots of variation which is why I favour plated & vermeil over solid gold. Depending on your skin acidity and if you have any intolerances to certain metals then gold plated jewellery could be a good option for you. 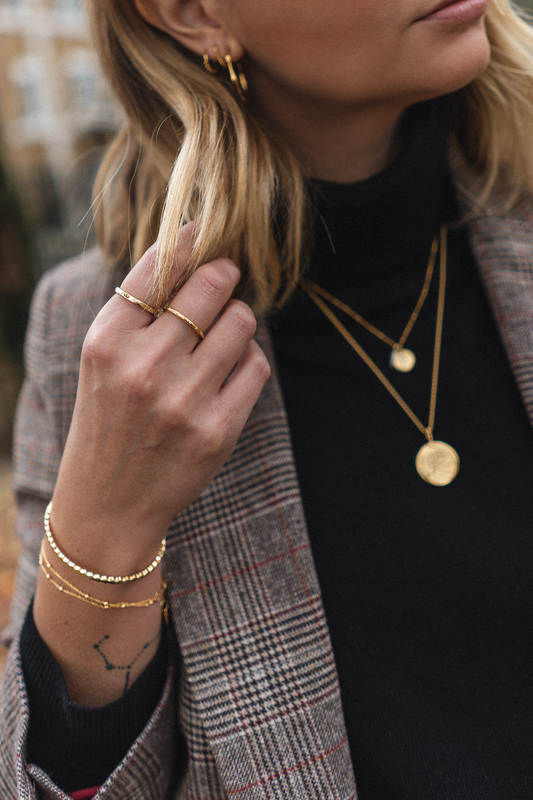 If you don't wear gold and prefer silver then sterling silver jewellery is often quite affordable, but as this post is about my style the focus will be on gold pieces. I wear a lot of Missoma and Monica Vinader jewellery which I totally understand can be quite pricey especially when it comes to getting the layered look. So I do have a lot of affordable alternatives for you guys to try. Orelia is a brand that I've fallen in love with over the past year, they have a lot of pieces similar to Missoma and they are very affordable. I would definitely recommend Orelia for huggies, I have several pairs which I mix in with my Missoma pieces and they look great. Mango have incredible costume jewellery which really makes a statement, it's not for every day wear but if you want to inject a jewellery trend of the moment then that's always my go-to. There are plenty of gold plated bargains to be had on Etsy and you'll find some really unique pieces on there along with a few dupes of some popular styles from the bigger brands. Basic costume jewellery which isn't plated in gold or doesn't have a quality base metal won't last long at all, so I'd save your money and not bother with that unless it's something for a special occasion (ie. statement earrings for a Christmas party) where you're not going to wear them that frequently. Or perhaps there's a jewellery trend that you really want to try, like the current Cèline alphabet necklace (as seen on ALL bloggers). Not everyone can afford to shell out £250 for an initial pendant (yeh, you don't even get the chain for that price), so you'll find a good dupe here for under £2, because let's face it, in a couple of months those necklaces are going to be 'so last season'. Topshop, ASOS and Accessorize (to name a few) all have very affordable gold plated lines and more often than not you'll only be paying a few quid more than their basic range so it's worth it. Some people might think 5 pairs of jeans is excessive, those people really wouldn't want to look in my wardrobe in that case, but I'm a denim girl and denim is a huge part of my daily style. A girl's gotta have options and as I wear jeans 95% of the time I like to have some variation there to give me some freedom to play around with different looks. My go-to stores on the high street for denim are & Other Stories (slightly pricey at around £59 a pair), Topshop (around £40 a pair), Mango (around £40 a pair and they have organic cotton! ), Next (from £18 a pair) and Zara (ranging from £25.99-£40 a pair). In terms of online retailers ASOS also do some pretty good denim although granted I haven't bought any ASOS jeans in quite some time now as my denim loyalties lie elsewhere. Make you jeans last longer by not washing them unless they're actually dirty. Pop them in the freezer instead, this will kill off any bacteria and freshen them up ready for their next outing. Probably one of the most frequently asked questions I get is where I buy my basics from and although I do have some premium brands that I like for basics, I usually tend to stick to high street. Topshop always come out with a classic boxy t-shirt every year, usually under £20 and they always have my colour bases covered. This past Summer season I was pretty impressed with & Other Stories' basic t-shirts, slightly steeper in price but still under £30. When it comes to Winter knits you guys probably know that I'm quite the sucker for cashmere, I just can't get enough of that stuff but I am aware that it's not necessarily affordable for everyone. However if you do have a little bit of extra cash to invest into your Winter basics then I would 100% recommend my favourite crew neck cashmere jumper from M&S. It's incredible value for money at £75, comes in so many different colours (including all on my checklist) and they last for years, I have a camel one which is three years old and it's still going strong. If the thought of spending £75 on one jumper makes you shudder then fret not, cashmere isn't the be all and end off of basic life. Who remembers the 'nibbled hem' jumper from my very first Zara haul? That little £25 knit was part of my wardrobe for well over a year and if you're a regular viewer of my weekly vlogs then you'll have seen how much I wore it. In fact I only waved goodbye to that knit earlier on this year when I replaced it with one of the famous M&S cashmere crew necks. It was a sad day but it served me well. My point is that a basic and affordable knit can work equally as well as something with a higher price tag. Now we're onto the all important task of making feet look good. I have to be really honest with you guys, when it comes to shoes I'm all about comfort. I now don't own any footwear that isn't comfortable and after years of torturing my feet in ridiculous high heels I vow to stick to that. I'm a big fan of trainers, loafers and ankle boots, again, the basics. I do have a fair few pairs of designer shoes which took me about 4 years to build up a core collection of but I also still love high street shoes. Topshop, Zara and Mango come out with some corkers and as I referenced in the opening of this post, Charles & Keith. In terms of trainers I have recently discovered Veja which are a sustainable brand so not particularly purse-friendly, however earlier on this year I picked up these Veja style dupes from M&S which are less than half the price. And if I just go back to what I said earlier in the post about sustainability also being about looking after what's in your wardrobe then there's nothing to say that a basic pair of budget-friendly trainers like these from Topshop won't last you for a few years with the right care. Until recently when I thought about loafers, Gucci instantly popped into my mind. I have 3 pairs of Gucci loafers and they are insanely comfortable. However after a store visit at Dune I found their affordable version of the classic loafer and I came away with a red pair to test in comparison to the Gucci's. After some extensive research I can confirm that there is no comfort different between the two, in fact there aren't many noticeable differences full stop. So if you're after a pair of loafers and can't stretch to Gucci then these from Dune are a must. Ankle boots are a weakness of mine, I cannot help but gravitate towards them when I see a pair that I don't have. I think most women probably own a pair of black ankle boots, they're classic, versatile and a must-have for Autumn/Winter. I recently developed a love for lace up boots like these, again the hold all those qualities I look for; comfort, practicality and versatility.